Every time that new findings are published about art found on the walls of caves, it seems that our links with artist ancestors get pushed back further and further in time. In other words, artists have been among the earliest hominoids to be able to organise abstract thought and find ways to express themselves visually. The remarkable announcement, about three days ago, that an Australian-Indonesian team has dated the ghostly outlines of human hands on the walls of Maros Cave, on the island of Sulawesi, to 39,900 years ago, has electrified everyone. Not only is this one of the oldest examples of a form of art (created by blowing pigment dust onto outstretched hands to create the negative outline), but it is the first proof that Europeans were not the only early artists. Asia had its share of them too. And most likely, given time and luck, examples of this early rupestrian art will be found in Africa too. Nonetheless, despite the dating of these hand outlines by sampling minute layers of the minerals covering them and using the radioactive uranium in some of them to fix this date of 39,900 years, there is another earlier artistic site. In the Panel of Hands in the El Castillo cave in northern Spain, a red dot amongst the hand outlines has been dated to more than 40,600 years ago. Not so long ago, at the beginning of September this year, there was another fascinating announcement, more controversial, but nonetheless pretty persuasive. In Gorham's Cave, Gibraltar, an abstract, almost hash-tag shaped rock engraving has been dated to about 39-40,000 years ago, but has been ascribed to Neanderthal artists. Just like their modern descendents, those far-away artists were capable of creating different types of art, whatever the purpose may have been. Again, this is not the oldest rock engraving - that distinction can be claimed by a 54,000 year old engraved sliver of rock found at the important archeological site, Quneltra, in the Golan Heights, Israel. These early traces of artistic endeavour keep turning up, making for mind-stretching connections if one is an artist. It is such a fascinating link. Why did those early artists create their images of hand outlines, of amazing animals (like the strange pig-deer, the babirusa, from Sulawesi), of deeply incised lines in obdurate rock? Why, too, did the artist depicting this babirusa exaggerate the animal's different proportions and, even more rare, place it on a ground surface instead of having it float on the wall as was usually done? If these artists were driven by the need to invoke spirits of their vital food sources, or signals to fellow inhabitants, or claim shelters, or whatever, they still had to get into deep, dark caves and have enough artificial light (fires, flares - flickering and fugitive) to see. They also had to take in with them the pigments and tools to create the art. They had to have the mental ability to conceive how to translate their ideas into art. That included a wonderful imagination about how to use the different characteristics and configurations of the cave walls and ceilings to the best advantage for their artistic purpose. In other words, they are no different from every artist today, in the 21st century. We all have to conceive of what to say in our art, how to do it, how best to get it seen by others, and - if we be so lucky - get it seen by our descendents millennia hence! Lorne Coutts is a frequently quoted advocate of drawing. One of his statements that resonates the most - understandably - is: "Drawing is risk. If risk is eliminated at any stage of the act, it is no longer drawing." (Trying to find out more about Lorne Coutts leads one to mysteries - borne in 1933, he has apparently published one book, in 1995. Entitled The Naked Drawings, it is out-of-print, with "image unavailable" on almost every listing - what a surprise! In any case, everyone who has ever launched into drawing, especially without the psychological support of an eraser, knows that the results are a gamble. Even the most skilled of draughtsmen will have a surprise sometimes, a huge success but also, potentially, a total disaster. Just as the thoughts we think and the words we utter sometimes surprise, delight or dismay us, so too the lines that we place on a drawing surface can be a high-wire affair. Even the very first lines made on the rock faces of caves such as Lascaux, France, showed that those artists, working some 40,000 years ago, were not only daring in concept and mastery of line, but they combined these aspects with the understanding of how to use the protuberances of the rocks to add extra impact to their drawings. Think of the amazing kaleidoscope of drawings, often very gestural, that show how the artist is combining eye-brain-body/hand coordination and skill to produce a series of marks on a surface. Western art is rich in such drawings, as is Eastern art. Think of Leonardo da Vinci's work in chalks, for instance, or go to the other side of the world, to Japan, for drawing with brush and ink. A little earlier, about 1510-15, back in Venice, Titian's searching chalks were recording this sensuous, thoughtful Young Woman, the lines probing and balancing - a deeply intense study. Tiziano Vecellio, called Titian (Italian, ca. 1485/90-1576). Study of a Young Woman (detail), ca. 1510. Black and white chalk on faded blue paper. 41.9 x 26.5 cm (whole drawing). There were so many extraordinary master draughtsmen during that period, from the Renaissance onwards, who could create fireworks and pirouettes of drawings - Michelangelo, Raphael, the Caracci brothers, Mantegna, Dürer, Caravaggio, Rubens, Tintoretto, and many, many others. One of the 17th century giants was of course Rembrandt. 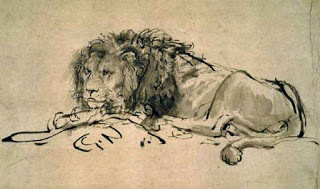 Just look at Rembrandt van Rijn's quick drawing of the two adults with the serious little child, or his flying strokes as he depicted this amazing lion. Two women teaching a child to walk, Rembrandt, 1635-37. Red chalk. Image courtesy of the British Museum. Jumping to the late 19th/ 20th century, the high-wire act still goes on for some artists who draw, draw and draw. 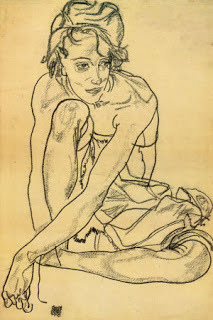 Gustav Klimt and Egon Schiele are two Viennese artists famed for their drawings. 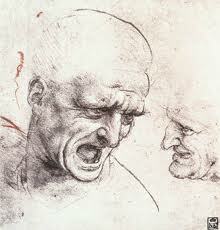 Another amazing draughtswoman working in Germany about the same time was Käthe Kollwitz. Constantly risking, constantly probing, she recorded human suffering and disasters in a way that rivets and remains in one's memory long afterwards. Even during the later 20th century when drawing skills were less appreciated, there were artist who persisted in working on the drawing trapezes. One of the high-flyers was Lucien Freud, who produced powerful, direct drawings, mostly of people, and sometimes his dogs. So many artists who dare to draw. They inspire the rest of us to aim for the high wires, even if the drawing only succeeds once in a while. But the more one draws, the more it becomes part of one's psyche. After all, as Keith Haring observed, "drawing is basically the same as it has been since prehistoric times. It brings together man and the world. It lives through magic." One of the most fascinating books I have recently read is Eric R. Kandel's newly published book, "The Age of Insight. The Quest to Understand the Unconscious in Art, Mind and Brain. FromVienna 1900 to the Present". It is dense, interesting and challenging, as it details the many new discoveries of how the brain works and the many dimensions of humankind's involvement with art over millennia. There are so many aspects of the book that are worth talking about, but one short passage resonated with me because of my recent visit to South Italy, a place so rich in history. Kandel goes on to allude to Cro-Magnon man painting those marvellous images in the Grotte Chauvet, 33,000 years ago, and reminds us that apparently, the Neanderthals, also living in Europe during that same period, did not create representational art. The conclusion which experts, such as social psychologist Ellen Dissanayake and art theorist Nancy Aiken, have reached is that art was a crucial means of binding people together during the Paleolithic age. People gathered together in communities and thus enhanced their likelihood of survival; one way to create this social glue was to make objects, images, and events that were important to these people, memorable and pleasurable. Just like the festivals celebrated all summer in Southern European towns and villages today, despite economic gloom; people enjoy themselves and reinvigorate their social ties, enhancing their daily life with religious or ceremonial events. I immediately remembered two humble, but to me very powerful, objects I had seen and drawn quickly in the Matera Archaeological Museum in South Italy. 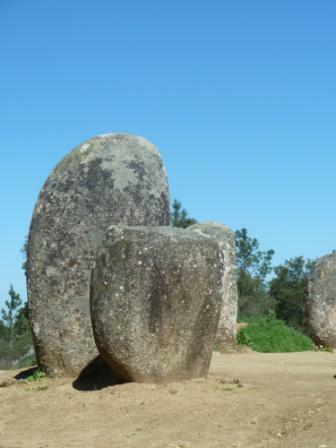 Hasty drawings, but what fascinated me was the literal binding-together marks that were on these stones, of a shape and size that would fit comfortably into a human hand. Just my interpretation of the marks, but I found them compelling. Even then, so many thousands of years ago, for the Upper Paleolithic age officially lasts from 45,000 to 10,000 years ago, our ancestors were scoring careful, thoughtful marks into stone, driven by a need to create art, art to bind those communities together most likely. 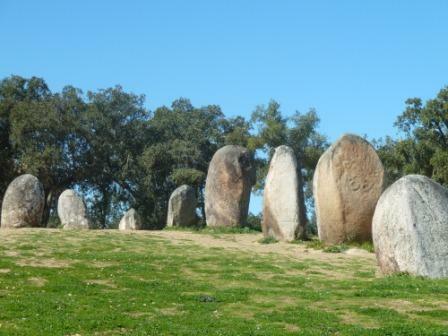 The fact that those stones can still compel our attention today makes an even stronger case for art's universal power to bind humans together. Sometimes life brings those wonderful connections and coincidences together to make a point in the art world, at least for me. Last Tuesday, 7th February, the papers were full of news of the death of the great Spanish painter, Antoni Tapies, at the age of 88. I had always associated his work with the highly imaginative and almost mystical use of all kinds of materials, from clay, marble, sand and earth to cloth, always with an evocation of man's passage through life, with its pain and experiences that were grounded in his Spanish world. I remember being riveted by his use of ochers and other clays in a passionate series of canvases that were exhibited in Mallorca a long time ago. As was reported in an article in The Nation, in 2004, Tapies spoke about his interest in "deeper, more serious colours" partly because he wanted to "feel close to the earth." "I have always wanted to get closer to the formations of the universe. Deep down, we are made of earth – and we go back to her." Tapies at his most tactile and Zen-like. Then comes the coincidence that I loved: in a February 8th, Wednesday, Diario de Mallorca newspaper, there is a small item of news that forms a wonderful linking circle for me. The famous Nerja Caves, in Andalucia, Spain, has a wealth of Paleolithic rock paintings dating for the most part between 16,000 and 20,000 years ago. However, it has just been ascertained that six of the rock paintings possibly date from 42,000 years ago, thus placing them amongst the first works of art created by man. Even more interesting is the hypothesis that Neanderthals created these rock paintings, not Homo sapiens. Quite a thought! 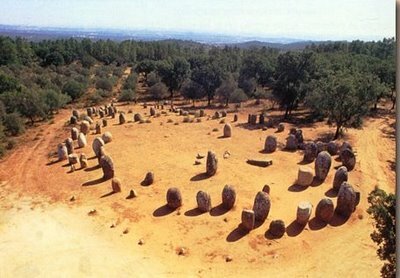 So a 20th century Spanish artist working for the most part in Cataluna, just up the east coast of Spain from the Nerja Caves, is hailed for his use of clay and other earths, and his deeply-held beliefs about humankind's mystical bonds with the earth. A few hundred miles and possibly about 42,000 years after early versions of mankind were virtually creating the same kind of mystical marking with the same clay materials. It certainly gives one a sense of perspective about what it is to be an artist. When I was writing recently about art being a form of self-portrait, a record of where each artist is in time and space and outlook in life, I remembered another statement, this time by Leonardo daVinci. He said, "Every painter paints himself. Painters seem to paint their own faces and make paintings that seem directly involved with their own life. " Indeed, there has been much speculation about many of Leonardo's portraits using his own features, such as this video of Siegfried Woldhek talking about his search for Leonardo's self-portraits. This image is the most famed, done between 1512-15 in red chalk, when Leonardo was in his sixties, a drawing in the Royal Library of Turin. The urge to record one's own existence, one's presence, has been with us humans since time immemorial. This form of saying "I exist, I am present", in visual fashion, is testimony to mankind's sense of community, of shared characteristics that are more important than their differences, at least at some moments in our history. One of the most amazing collections of human representations is apparently becoming better known and understood in recent years - the GwionGwion rock paintings in the Kimberly area in N.W. Australia. Not only are these rock paintings probably more than 40,000 years old, but they tell of human life and adventures in stunning, elegant fashion. Bradshaw figure, ( courtesy of the Bradshaw Foundation). As examples of artwork that reveals the artist's own experience, in "self-portraiture" style, there is a red rock painting of a boat, the earliest known in history, that tells of man's migration to Australia via a four-man canoe on the Gwion Gwion rocks. There is also another long panorama of four-legged, antlered animals that the artist had evidently seen during the migration from SE Asia. There are no such animals, now or in early times, in Australia. Gwion Gwion (Bradshaw) paintings on a rock wall. This huge collection of rock paintings, in hostile, difficult and remote terrain is an astounding example of man recording existence, beliefs, and ceremonies from very early times that one author, Jo Lennan, describes as "a forgotten Eden". The name, Gwion Gwion, comes from a bird's name. The Aboriginal people recount that this bird pecked the rock with such force that its blood sprang forth and it used its bloodied beak and feather to delineate the elegant, dainty figures. Indeed, it is thought by today's experts that these long-ago artists actually used quills to make the fine lines on the rocks. The actual dates of these early artists' work are still being determined, because the pigments used to draw have become part of the rocks themselves, and carbon dating doesn't work, especially in the tropics where its limits of dating go back +-40,000 years. Nonetheless, apparently on top of one drawing, there is a fossilised mud wasp's nest, and optical luminescence (which dates when something last saw the light of the sun) allowed a date of about 17,500 years for the drawing. This means that these artists were telling of themselves and their world at the same time as their long-distant colleagues were painting the wonderful images of their immediate universe on the cave walls in Lascaux, France. What marvels we all inherit when such artists create "self-portraits" of their personal worlds.